Dubbed as National Protest for Rights, Freedom, and Democracy, youth and students from different universities and colleges nationwide walked out from their classes carrying calls to defend press freedom, stop the killings, free education for all levels, genuine land reform, scrapping of jeepney modernization program, among many others. Photo grabbed from Tonyo Cruz’s Facebook page. Amid threats of Duterte to kick them out from the university, hundreds students of the University of the Philippines in Diliman, Quezon City stood for students’ and people’s rights as they symbolically shutdown the university. 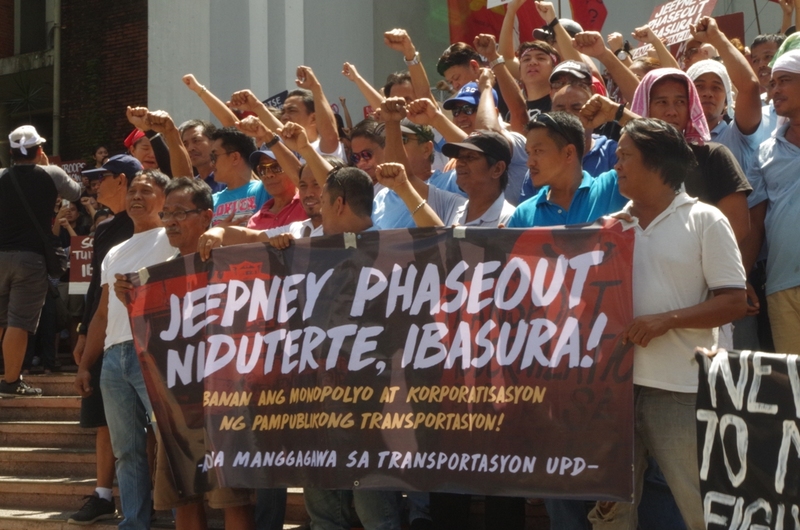 They were joined by vendors and the jeepney drivers as they gathered at the AS Steps at Palma Hall where they locked the gates. UP Chancellor Michael Tan has also endorsed the activity as well as the commemoration of the Edsa People Power on Feb. 24, for the students to be able to participate. “We need to encourage our students to participate in the said activities as part of their education” the memorandum read. 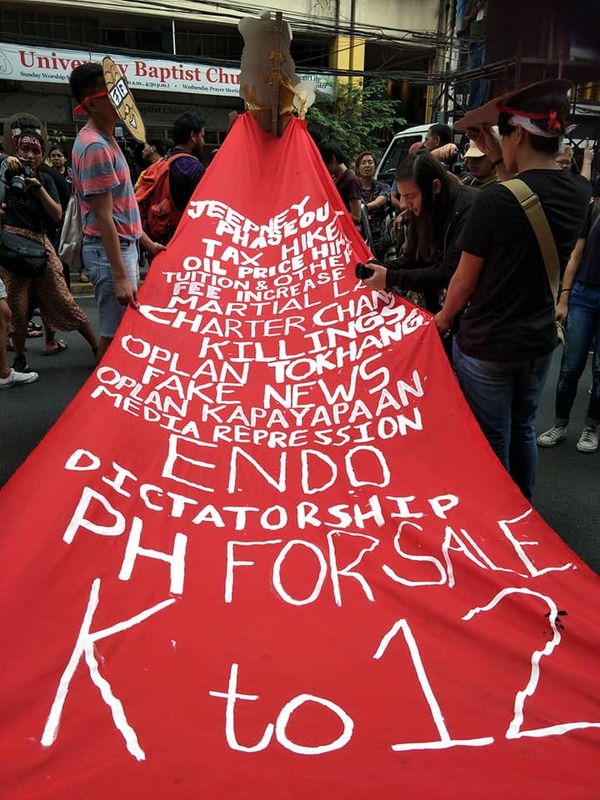 “The worsening conditions of politics, the economy, and human rights give all the reasons for the youth to join the masses in their call for an end to President Duterte’s rising dictatorship. 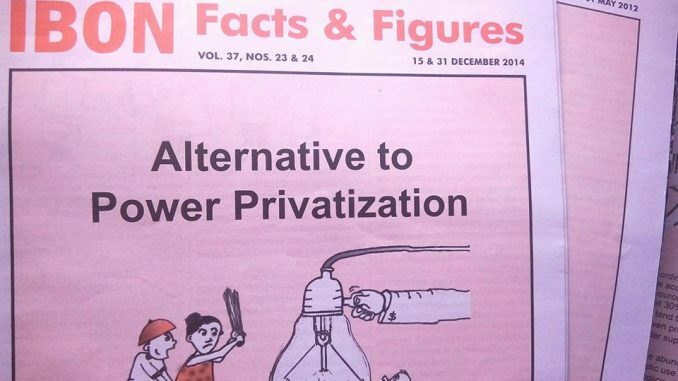 State neglect has never been more blatant; state violence has never been more rampant,” Kabataan Partylist Rep. Sarah Elago said in a statement. 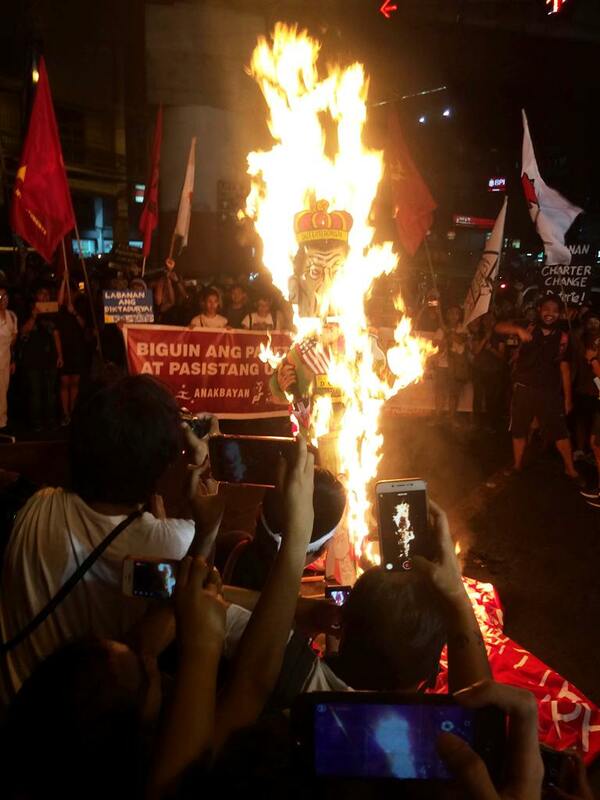 The youth were later joined by different sectors as they assembled at España Boulevard in Manila and marched to Chino Roces bridge (former Mendiola bridge) and burned Duterte’s effigy. Students from the Ateneo De Manila University (ADMU), De La Salle University (DLSU), University of Sto. Tomas (UST), Polytechnic University of the Philippines (PUP), San Sebastian College, and many other schools and universities also joined the protest in Mendiola. 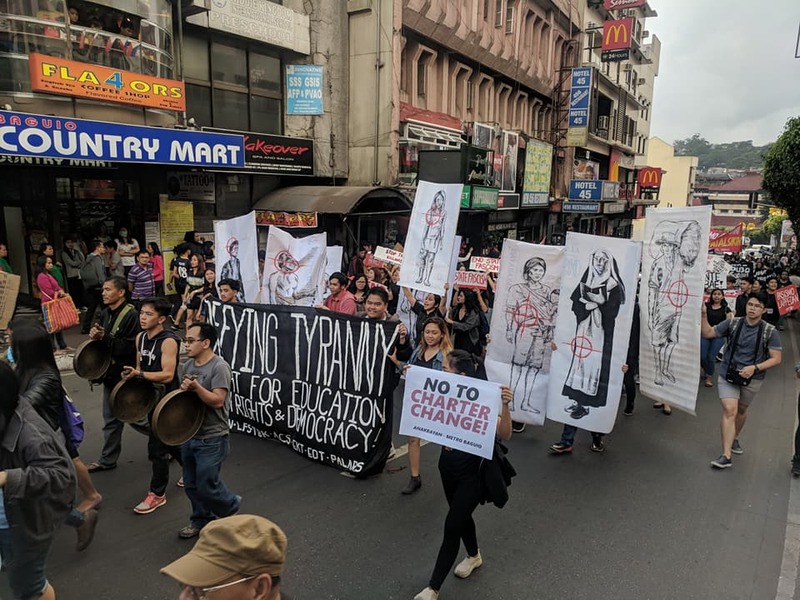 Students from different campuses of the UP system also held demonstrations such as UP Los Banos, UP Miag-ao in Iloilo, UP Cebu and UP Mindanao. 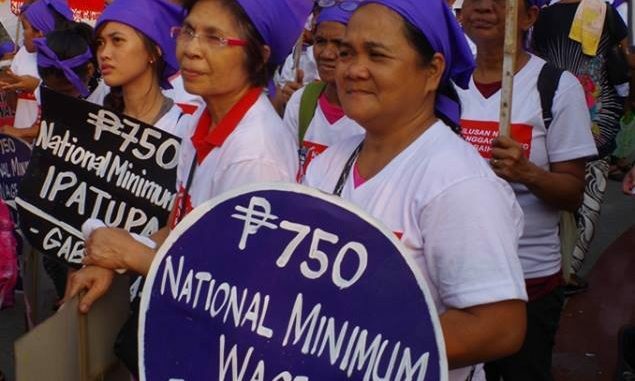 “We are here today to show that we are determined to fight for our rights, freedom and democracy,” said Elago during a short program in Morayta before they proceeded to Mendiola. 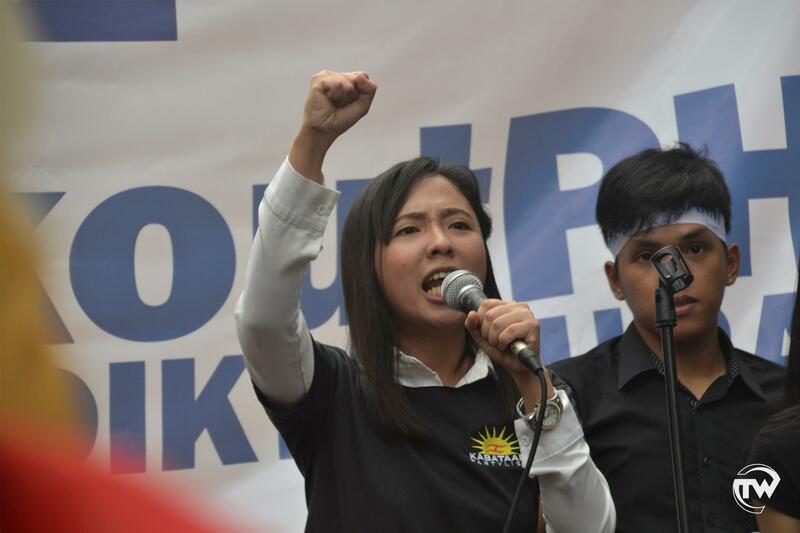 The post ‘Youthquake 2.0’ | Youth and students show strength amid Duterte regime’s ‘rising tyranny’ appeared first on Bulatlat.